Okay, we will. 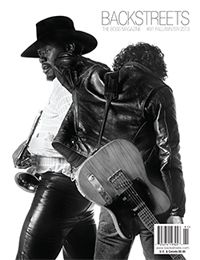 Our 65-page Clarence Clemons tribute kicks off with Big Man: The Final Chapter, an epilogue to Clarence's book written exclusively for us by his co-author and longtime friend, Don Reo. After that, page after page of remembrances from longtime friends, colleagues, and fellow musicians, including Little Steven, Robert Santelli, "Stormin'" Norman Seldin of the Joyful Noyze, Vini Lopez, Ernest "Boom" Carter, Mike Appel, J.T. Bowen, Narada Michael Walden, Branford Marsalis, Dale Maharidge, Jo Lopez, Nick Mead, and eulogies from Jake Clemons and Bruce Springsteen. We've also packed this tribute with stunning images spanning 40 years, from photographers including Eric Meola, Barbara Pyle, Frank Stefanko, Jim Marchese, Rene Van Diemen, Victoria Clemons, James Shive, James Appel, Michael S. Williamson, Teresa Psykaty-Lamicella, Joseph Quever, Guy Aceto, A.M. Saddler, Michael Zorn, and the archives of Billy Smith. The Clarence tribute section is, appropriately, massive. But it's not the only feature here. We also present the Backstreets Interview with Tom Morello, conducted by editor Christopher Phillips. Over two sessions, and 11 pages in the magazine, Tom discusses his fandom, relationship and work with "the only friend I have who I also subscribe to a magazine about." Plus: The impending High Hopes, Q&As with Bruce author Peter Ames Carlin and For Music's Sake author Carrie Potter, "fan-based recordings" reviews, and much more. 116 pages, perfect bound, full-color. If you enjoy our website, we know you'll love the magazine, and subscribing is a great way to offer your support (and get significant savings off the cover price). If you'd prefer not to commit, you can order a single copy of this issue. Although Backstreets Magazine is available at a number of bookstores, record stores, and newsstands around the nation and even overseas, availability is not something you can count on in most areas. If you're interested in the magazine, we highly recommend that you consider subscribing  not only to support Backstreets directly, but for the convenience of getting the magazine as soon as it comes off the press and at a discount from the cover price. Subscriptions are risk-free: as with everything we sell, we offer a money-back satisfaction guarantee. For those who'd prefer not to subscribe, you can also purchase a single issue directly from us -- tax-free (except in North Carolina), without hunting on newsstands, and we'll ship anywhere in the world. Click here to buy a single issue direct. ...and through independent distributors, to numerous other stores around the U.S. including many Borders and Barnes & Noble locations. 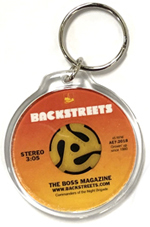 If your store carries Backstreets, feel free to contact us with your store name and address, and we'll happily add it to this page. If you can't find the magazine at a proverbial "store near you," please ask your local record stores, booksellers and newsstands to carry Backstreets! Interested stores can contact our office for wholesale information. Although the magazine's audience is select, the sell-through percentage is extremely high and the magazine is offered to distributors on a guaranteed full-return basis. In addition to direct distribution, Backstreets is distributed through Ingram, Kent News Company, Ubiquity, and Armadillo.